The mission of the SIUE East St. Louis Charter High School is to prepare students, who are career- and college- ready, upon graduation. To achieve this mission, the school and its staff will positively impact the educational and economic lives of East St. Louis, IL youth through:The SIUE Charter High School is a school-of choice for families in the East St. Louis School District 189. 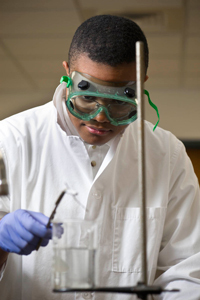 The SIUE East St. Louis Charter High School serves a total of 100 students from grades 9-12. Our students will have access to the latest technology, equipment and curricula in our $1 million STEM classroom.